The Best Ebook Readers For Android with the best technology has gotten to a stage where ebook reader apps have replaced printed books, making it more easier to simply read your favorite Best Ebook Readers For Android, with the use of your smartphone. I know there are lots of questions running through your mind like; how possible is it to read a book with the use of your smartphone and so much more, but calm down, I will tell you how. Well, you can simply do that by downloading several Best Ebook Readers For Android and also the book you wish too read. Most ebook readers for android can even provide you with hundreds of free books and even get to search for more books and start reading them immediately. Finding the perfect ebook readers for android seems difficult, But I am here to provide a list of Best Ebook Readers For Android for you. So kindly take your time to go through the list of best ebook reader apps for Android below. Amazon Kindle is one of the best ebook readers for Android. The Kindle app offers a wide selection of books, magazines, newspapers and so much more and that makes it one of the best ebook readers for Android. This app is owned by one of the most popular online shopping sites called Amazon. It also has an inbuilt dictionary that makes it easy for you to look up a word. The app also syncs your bookmarks, last read page, and some other useful information across all devices. The most interesting part of the app is the feature that allows you to make researches with the aid of search engines like Google search and Wikipedia and so much more. The homepage user interface of this app is filled with lots of ads but the ads are not displayed on the reading part. You can also make some customizations on the way the app performs and also get to save books for offline use. Not all books are for free, some are being paid for and their prices depend on what country you are based in. The second baby on the list is called Aldiko Book Reader and its one of the best alternatives to some of the best ebook readers for Android. This app is a perfect ebook reader for PDF and ePub formats. It’s too bad that this app does not automatically save your books and does not sync any information. However, if you wish to save a book offline, all you have to just do is to download the book externally and import into the app. It also supports ebooks from public libraries and also has a nice user interface that supports and fits tablets modes too. This app also has a nice in-app shopping feature that allows you to browse through a wide collection of books and also purchase some books too. There are other cool features like global-text search in a book, dictionary, and the ability to add your own favorite catalogs and many more. Cool reader is also one of the android ebook readers that has a customizable palette, text formatting for any and some other pleasurable features. This ebook reader app for Android also has the text to speech feature which most ebook readers does not have. It also has the night mode feature that gives you two colors for convenient reading. This app also provides you with information on page counts, percentage read, and chapter marks at the top of the screen. It also supports various types of file formats such as ePub, fb2, HTML, rtf, txt and so much more. 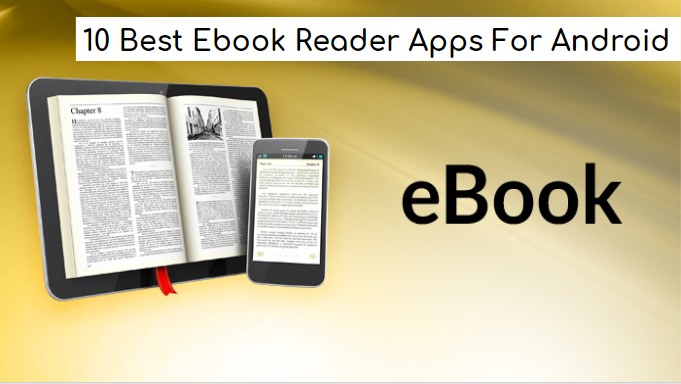 This ebook reader is a customizable ebook reader for all devices. You can get to choose your font size, font color, animations, bookmarks and so much more to help make reading comfortably. This app also helps sort your library according to authors, titles, and the name of books by providing a simple view of it. This app also supports various plugins, and some other text format, so you can literally read files in a format that might not open in other ebook readers but will open with FBReader. Now, you can also access the internet through the browser that is available in this ebook reader, so if any book or file that you open has a link that is needed to be opened by a web browser, the FBReader browser will open it with ease. It is that simple and easy to handle. A full editable ebook reader, one of the best I have come across. I’m just going to go straight to the important features, like this ebook reader supports a lot of vital book format like; epub, html, pdf, mobi, chm, rar, cbz, zip, fb2, txt, cbr, zip, umd and lots more. You can change themes and keep the coolness alive, adjust the brightness for the different time variations, you can use swipe gestures also, you can set the reader on an auto-scroll mode that will allow you read without touching the screen, the features in this app just keeps getting better and better. You have over 40 languages in this ebook reader, so you don’t have to worry, any race or person can read this book with ease, all they will have to do is change the default language to theirs and read as many books as they possibly can. I can go on and on about how many book format this ebook reader has, but unfortunately not as much as the previous ebook reader, but enough to give you joy. Now, for security and privacy purposes, this ebook reader doesn’t import books or files from another reader or from any source at all. This book arranges its’s book in an organized manner, so anytime you visit the app, you can find any book you want, through either searching for the name of the book or the author. Ebook readers have really evolved from when last they were used, now, new features have made ebook reader more effective and used, and has rendered printed books to be obsolete. This ebook reader is cheap enough for you to download and start using, just 22mb in the installation size. This ebook reader is one of the Best Ebook Reader Apps For Android so far and one of the most popular ebook reader available on almost all Android devices. This book reader can not only view books but can also view pictures and some videos. With WPS Office, you can’t only just read books online and offline, you can also convert pdf files that might refuse to open on your WPS, so converting is certain. You can even scan your files through WPS with your mobile’s camera. You can also connect your WPS Office reader to the cloud drive and save some of your books there. WPS Office is very wide, so trust me if you have an app like WPS Office on your Android device, you are sure to read more books than you have ever read with printed copies. You can customize your WPS Office to new cool transition effects, animations and text layouts. WPS Office is very smooth and easy to use, one of the widely used pdf and ebook reader. This is one of the advanced ebook readers on google play store today, with highly improved features. Personalize your ebook like never before with this amazing ebook reader app for Android, You can even listen to books you download via audio. So in days when you are tired, probably back from work and you’ve just rested and want to read a book from your Android device, you can simply put the book on audio and sit back and listen and enjoy. You can read books from this ebook reader app via audio from any language at all. So wherever you’re from, the audio feature can still be used by you in any language. You can even listen and translate, the features that make this ebook reader on my radar are not over yet, this app still gets updates from time to time, so you can be sure to get a new feature when a new update arrives. Bluefire Reader is available on google play store, in fact, one of the oldest ebook reader app to be developed. The app allows several features that include contextual searching, bookmarking, dictionary lookup, highlighting, note-taking, and many more. You can customize your display and reading settings in the options menu, to tend to your personal reading requirements. Day and Night mode is also present in this ebook reader app, which enables the user reading in low light to see just fine. Bluefire also has a page synchronization feature, that you can use to read across any device without losing track of the page you are currently on. Bluefire also allows analytic services. This provides key metrics as a guide to access some certain services in the ebook app. It also allows in-app browsing and thank God there are no Ads to annoy you. A downloading feature makes reading smooth and easy, enjoyable and fun. So click the download link now and begin. Wattpad is a unique eBook reader for Android with a simple friendly user interface. Getting an eBook to read, is quite easy with this app. You can either from your own search, find a book via the Wattad’s internal web browser or type in the book’s code. With Wattpad, you can change the background color and text color to your taste. You can also, from the settings option adjust the font size of the text on all your books so that it is readable and comfortable as you read. If you are getting low on space on your Ebook reader, you can also download the books that you plan on reading in parts. Wattpad is a cool and easy to use eBook reader app that is just okay for light readers. The Best Ebook Reader For Android users are quite cheap to purchase on the Android app store or google play store, so you can have more than one ebook reader and switch between ebooks. Ebook readers have made life easy, that is the development that can make things and allow us to read a large size of a book anywhere we are. That is the kind of size that will be too cumbersome to carry up and down, everywhere we go. So we say a big thank you to the developers of ebook readers and a big thank you for viewing this post and clicking on our cute links below and download more than one of my Best Ebook Reader For Android.